"So you fight for money? For Fame? These things are fleeting. I fight for an ideal… For a true purpose… All other things fall before me, and so shall you…"
The Kensai masters body, mind, weapon, and will. He devotes his strength and his life to the service of a master or an ideal he accepts as greater than himself. Some kensai become masters in their own right, but even one who becomes an emperor sees himself as a servant of some higher power. Most characters who become kensai aspire to the class from the beginning of their careers. Often, other kensei or elite military organizations train likely young men and women in the principles of service, the arts of war, and the purity of mind and body necessary to become a kensai. Even those who do not qualify at the end often become powerful adventurers. A kensai can be a lone adventurer, serving an ideal or attempting to fulfill a lifetime goal. Some kensai swear fealty to great lords and rise to become trusted bodyguards, warlords, or leaders in the lord's service. Monks and paladins know the strenuous road a kensai must travel, and some tread that path. Fighters value the might of the kensai, and some clerics have been known to join their ranks. Few wizards or sorcerers achieve kensai status, and bards and barbarians find themselves particularly unsuited to service as a kensai. While it might be thought that a rogue would make a poor kensai, such characters are not unheard of and can be deadly adversaries. To qualify to become a Kensai, a character must fulfill all the following criteria. Special: Must complete an oath of service to either an overlord or an ideal. Weapon and Armor Proficiency: Kensai gain no proficiency with any weapon or armor. Signature Weapon (Su): The kensai chooses one of his weapons (It must be one for which he has the Weapon Focus feat) to become a signature weapon. Most Kensai choose either a sword or bow for this weapon, but even a kensai's natural weapons can be chosen. If the weapon is a manufactured one, it must be of at least masterwork quality. Upon qualifying for the class, a kensai gains the ability to establish a link with his signature weapon. The character focuses part of his life energy on the weapon, making it more effective in his hands and his hands alone. The process for imbuing a signature weapon with power is a simple one. The character must find a quiet, safe spot to meditate (and pray, for those kensai who serve deities) for 24 hours. At the end of this meditation, the kensai sacrifices a number of experience points, essentially shifting some of his life force into his signature weapon. The signature weapon then becomes a magic weapon (if it wasn't already) and gains an enhancement bonus and/or special abilities. His current class level limits the amount of enhancements a kensai can place into his signature weapon. A kensai cannot create a signature weapon if doing so would cost enough experience points to reduce his character level. Use the following table to determine XP costs and class level limits. *A weapon can't actually have an enhancement bonus higher than +5, but it can have special abilities that are the equivalent of additional bonuses. Imbuing Double Weapons: A double weapon may be imbued, but both ends of the weapon must be paid for separately. Losing a Signature Weapon: If a kensai's signature weapon is lost or stolen, the character must strive to recover it by any means that do not violate his oath or alignment. A kensai that knowingly abandons a signature weapon is treated as if he broke his oath of service. A kensai who abandons a signature weapon and atones for the deed can begin to create a new signature weapon. If someone destroys a kensai's signature weapon, only the kensai can repair it. If enough is left of the weapon to salvage it (the shattered shards of a sword for example), the kensai can reforge the weapon as if he were using the Craft (weapon-smithing) skill to make a masterwork weapon. If he takes the reforged weapon and then meditates for 24 hours, he may pay the appropriate XP cost to restore his weapon to full strength. Should nothing remain of the weapon, the kensai must begin anew with a weapon that has never before been imbued. The character, however, has not failed in his oath - the destruction of a kensai's weapon in service of his oath is not shameful, and other kensai are likely to show even more respect to a comrade whose weapon is destroyed in oathbound service. Losing Natural Weapons: If a kensai loses his natural weapons (such as his fists), he may have them regrown by using regeneration or a similar spell. In this singular case, the kensai does not need to spend anymore XP or time to reimbue his signature weapon with power. The link is direct enough that no extra effort is neccessary. Power Surge (Ex): At 2nd level, a kensai gains the ability to make a DC 15 Concentration check as a move action to focus his energy and spirit. If he succeeds, he gains +8 to his Strength for a number of rounds equal to one-half his class level. Each time after the first that a kensai successfully uses this ability in a 24 hour period, the check DC increases by 5. Ki Projection: At 4th level and higher, a kensai adds one-half his class level (round down), to any Bluff, Diplomacy, Gather Information, or Intimidate checks he makes. At 7th level and higher, the kensai adds his full class level to such checks. A target that realizes it has been fooled by a kensai's successful bluff check gains a +10 bonus on any check or saving throw involving the kensai's use of Bluff, Diplomacy, Gather Information, or Intimidate against that target in the future. The kensai can regain the creature's trust by changing its attitude from unfriendly to friendly. Withstand (Ex): When a kensai of 5th level or higher is forced to make a reflex save to avoid damage from an area effect spell (like fireball for example), he can make a Concentration check instead of a Reflex save to resist taking full damage. If a kensai has the evasion or improved evasion ability, those benefits apply on his Concentration check as well. Instill (Ex): Once per day, a kensai of 8th level or higher may take a full-round action to make a Concentration check (DC 10 + target's HD or character level) to impart some of his own ability into a willing ally he can touch. The kensai then transfers some of his power to the ally: He subtracts up to 1 point per class level from his base attack bonus and/or any or all of his base save bonuses and transfers the same amount to the recipient. The kensai regains the instilled power 1 hour later, when it transfers back out of the ally. If the ally dies before the instilled power is transferred back, the kensai must make a Fortitude save (DC 5 + target's HD or character level) or die as well. If he succeeds, he immediately gets his instilled powers back. Ki Warlord: When a kensai gains 10th level, he gains great notoriety and becomes known as a ki warlord. Other kensai of the same alignment revere the ki warlord, and even those of differing alignments treat him with some measure of respect. If the ki warlord has an NPC master, this master likely assigns the ki warlord more responsibility and authority within his domain (perhaps giving him a castle, monastery, or military school). If the ki warlord serves a deity, that deity may take a personal interest in giving the ki warlord more responsibility, perhaps actually contacting the ki warlord directly or through intermediaries and making the deity's wishes known. In addition to this added responsibility, a ki warlord gains some tangible benefits. 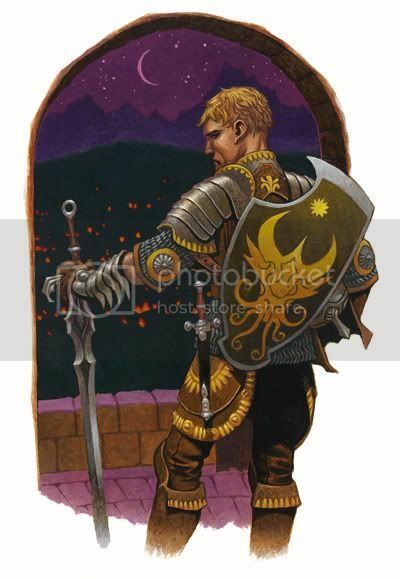 He has the right to petition other (lower-level) members of the prestige class for assistance on adventures or in the fulfillment of his oath. As long as a ki warlord's requests do not violate the other members' own oaths of service or alignment, lower-level kensai have a repsonsability to assist a ki warlord in any reasonable manner - such as providing food and shelter, access to minor resources, and other things another character might have to barter for. Ki warlords inspire those around them. When fighting within 30 feet of a ki warlord, allies gain a +1 morale bonus on Will saves, Concentration checks, and attack rolls. Lawful allies gain a +2 morale bonus on these checks. A kensai's oath of service must be sworn in front of witnesses and must be upheld for the kensai to continue advancing in levels. Typical oaths include swearing service to a powerful lord of the kensai's alignment, to an organization with the same alignment and goals of the kensai, to the kensai's deity, or even to an ideal or principle the kensai upholds. These oaths are not trivial, and prospective kensai who attempt to enter the prestige class with broad oaths or ones deliberately easy to fulfill find themselves spurned and cannot join the class at all, even if they meet the other requirements. A kensai who breaks his oath, for whatever reason, loses access to his kensai special abilities and must receive an atonement spell from a cleric or druid of his alignment to get them back and to continue advancing in the kensai class. A kensai must also strictly adhere to his alignment. A kensai who intentionally and seriously violates his alignment also breaks faith and endures the same negative effects. This dual requirement can pose a serious conundrum at times. If a lawful good kensai swears service to a lord who then orders the kensai to perform an evil act, the kensai is caught between his oath and his alignment. He must violate one to fulfill the other, and either way he needs to atone. If the kensai chooses his alignment, he can break his oath, gain atonement, and swear a new oath (often one relating to "correcting" his former lord). He can then advance as a kensai again. If the kensai chooses his lord, he changes alignment and must gain atonement from, in this case, an evil cleric. A kensai who changes his alignment from lawful loses his kensai abilities and cannot advance further in this class until he gains atonement and switches his alignment back to lawful. If a kensai fulfills an oath of service, or if the terms of the oath no longer apply (for example, if a kensai swears service to a king who dies of old age, or if a kensai swears to defeat an enemy power and then in the course of adventuring defeats it), the kensai must reflect and then swear a new oath. In general, a kensai can be "between oaths" for no more than one week per class level. A kensai who does not swear a new oath before the grace period expires is treated as if he broke his oath of service. Multiclassing Note: A samurai, paladin, or monk who becomes a kensai may continue advancing in these classes.